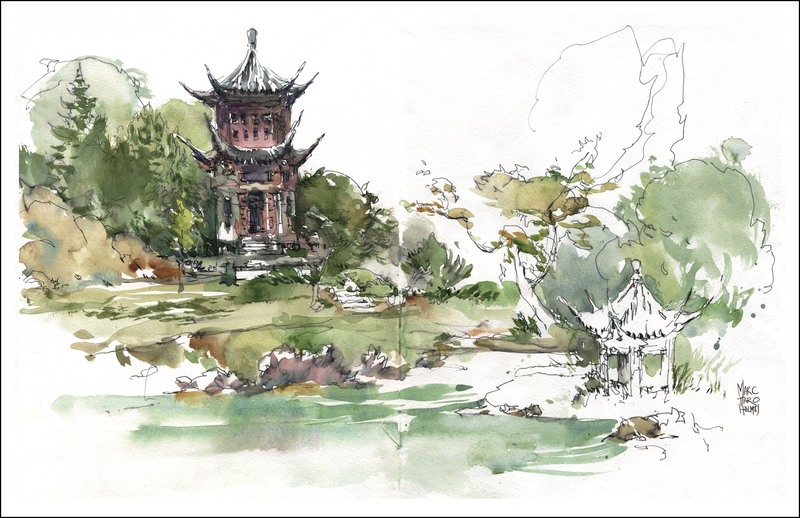 Just back from sketching with Urban Sketchers Montreal. 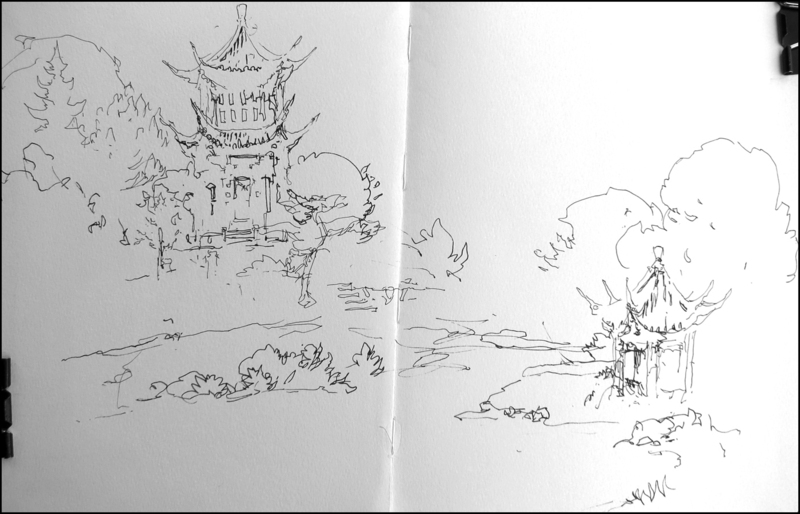 Here’s my morning drawing from the Chinese pavilion at Montreal’s Jardin Botanique. This one turned out to be a useful example of what I call “Marking Extents”. 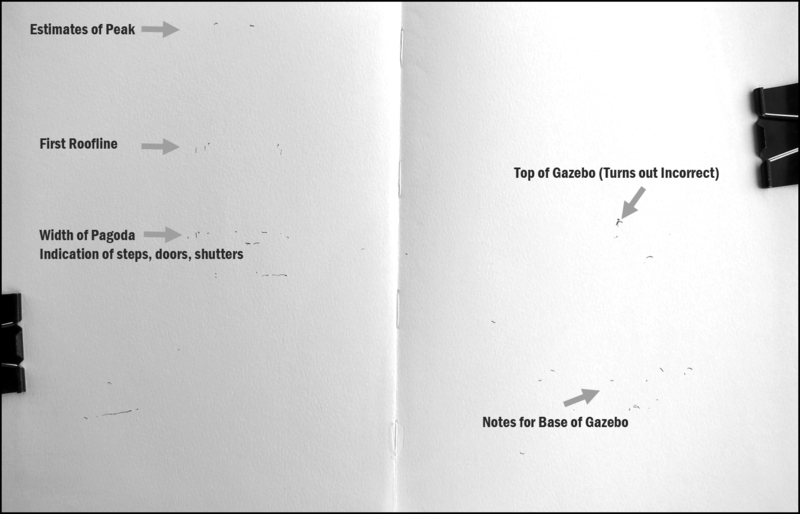 How to design the page with small dots measuring the height and width of key objects, and their internal landmarks (doors, windows, floors, etc). 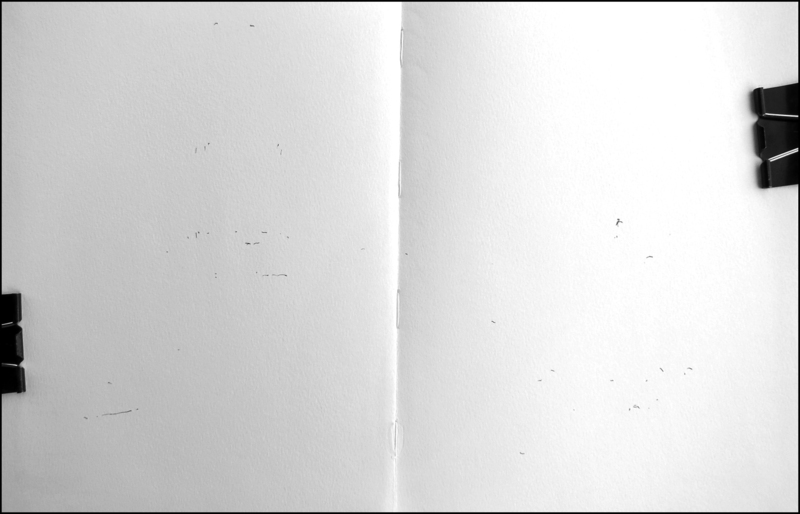 This is not a blank page. Zoom in and have a look. All those small dots and dashes? 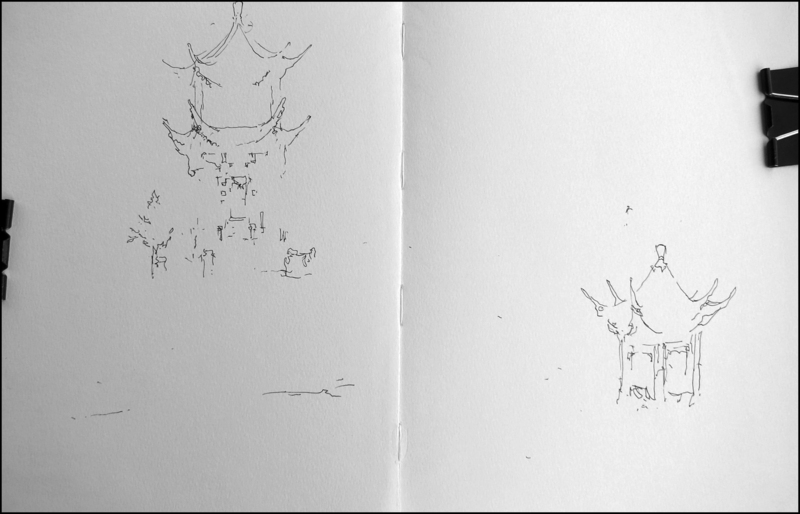 These are measurements describing the two Chinese gazebos. I spent about 10 minutes making these small marks, so that when I begin drawing, I have a mental map to work from. My main goal – to avoid going off the top of the page. And you can see I’ve barely succeeded. The taller of the towers is going to get uncomfortably close to the top. But! This is an honest example of me sketching. I like to be reasonably accurate – but I’m not the type to allow measuring to slow me down. You can use this tactic with much more discipline – it’s possible to be perfect. Mostly I’m just ‘eyeballing’ so it’s close enough to keep me happy. So this is the ‘final’ drawing – just enough to begin with the color. In the past I might have wanted to do a very precise under drawing in pencil. These days, I’m feeling I don’t need that support structure. I still recommend students try to get the best drawing possible – but when I’m having fun, drawing for enjoyment, this is how it’s turning out these days. thankyou thankyou thankyou!!! i love seeing the ‘pros’ show us your methods, your oops, and the recovery… these really help me see the ‘process’. its never the destination. its always the journey. thank you again!!! I do think putting down dots is a v good way of making sure the picture stays within the paper area, unfortunately I still forget which dot is which – I just need more practice at it! Interesting – I’ll have to try it! Yeah, it makes sense with dots. Thanks for sharing your method with us. Your art work inspired me a great deal. Yeah, thank you! Please keep this up. Thank you for generously sharing your advice! Much appreciated. I love your ‘style’ …. your pictures are a joy to look at and it’s making me want to paint again but I had to give up some years ago cos of age- related eyesight and arthritic problems. I’ve taken up photography instead ! Hey Eileen – sorry to hear about your arthritis etc. I’m glad you found photography. My wife is a photog, she loves it – the only person I know that can spend longer than me looking at an old church yard or some such:) Great these days what we can do with digital cameras. Interesting, and I will give it a try the next plein air session. Thanks!